Hey there folks. Now, usually, I’m all about games that catch my eye artistically. I mean, seriously, I’m devoted to companies like Double Fine and thatgamecompany and the artistic games they output. I find that games and art have this, sort of, symbiotic relationship. This being said, I’ve found that recently I’ve been enjoying a number of games that characterize how games can truly emphasize their artistic merits. 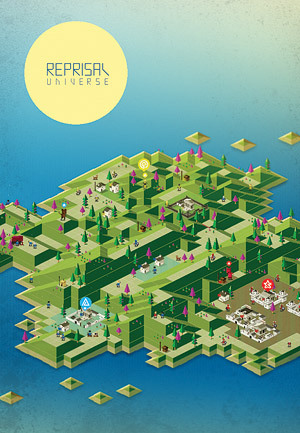 I’ve traveled in a demo of thatgamecompany’s Journey, I’ve been marveling longingly at video for The Unfinished Swan, and I’ve even been playing a lovely retro-art game called Reprisal by Electrolyte Games founder and designer, Jon Caplin. Retro Revolutions – ahh how I love them! This game transports me back to the days of my Gameboy Color, with it’s tightly interwoven text-based storyline, it’s hauntingly beautiful chip-tune soundtrack, and it’s pixelated, vibrant art style. 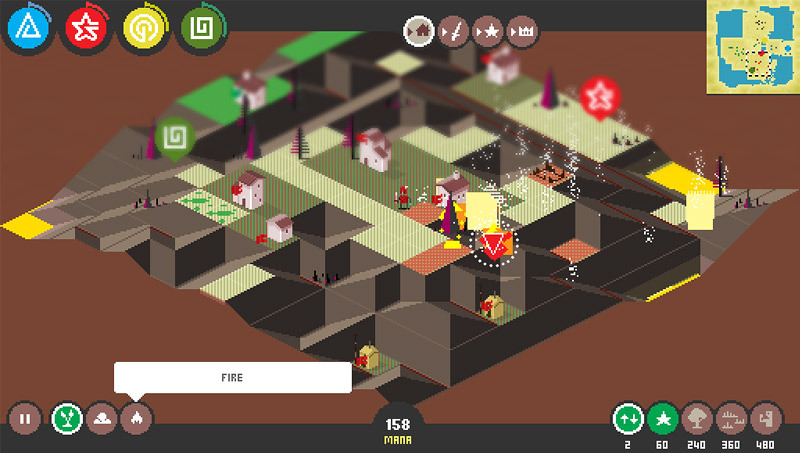 This game all but had me at, “Hello.” So, without further ado, let’s dive in to Reprisal. Conquer your foes! – with pixelated toes! As if it were something out of Avatar, you play as the leader of a nation trying to acquire both land and elemental powers back from warring tribes. There are 4 nations and 30 levels within the game. While some of the beginning levels are quite easy, as you advance in skill gaining more and more new powers, the game gets more complicated and intriguing. The game has heavy elements of strategy and coordination and will definitely keep a player guessing as to how to defeat and conquer islands. It definitely reminds me of a throwback of the old game Populous. If you haven’t ever played that game, then this game will definitely give you a reason to go check out a vintage classic. I set FIRE – TO THE PLAINS! Watch them BURN as I STEAL YOUR BASE! Now, how about those accessible features? Well I’ll spare you a dissertation and open up! All game instructions are done via text-based format. Perfect for deaf players. Controls extremely simple. WASD/Arrow Keys can be used to view map. Chiptune music is amazingly relaxing and a welcome from the retro classics. Color scheme is vibrant and characters, although pixelated, are easy to identify. 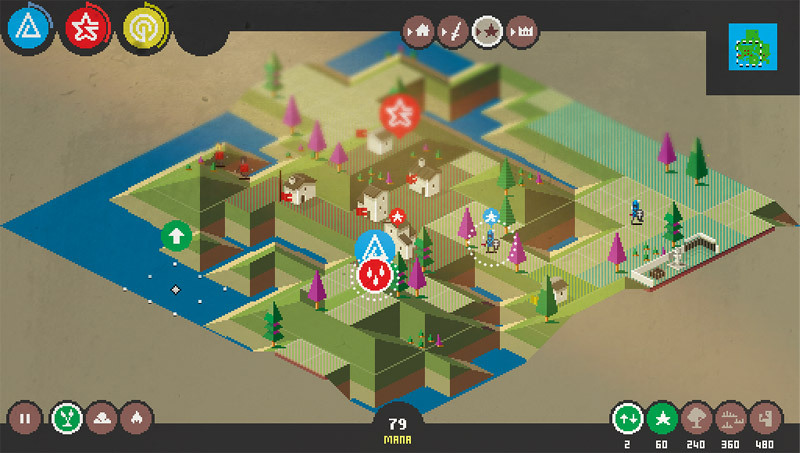 Game maps aren’t severely large so it makes for easy navigation. HUD display provides easy access for all spells, advice, etc. Chip-tune soundtrack can tend to get repetitive, but is easily muted. Colorblind gamers may have an issue with some levels due to similar color tones. i.e. Green tribe on ‘forest’ land, Blue tribe on ‘ice’ land, etc. Game has to be saved in order to play, so it requires a use of a Kongregate account. Game gives no hints/instructions on how to defeat enemies if you get stuck. Game AI can quickly overwhelm you if you don’t strategize properly. Overall the game not only gives a lovely artistic twinge to the start of my day, but it keeps my brain working like crazy to try and determine how to defeat these pixelated powerhouses. The game lacks a bit in defining it’s storyline, but it definitely imposes a great strategy game within a very simple beginning narrative. It always makes me smile when designers can put together something so simple and make something so special! So quickly, grab your keyboard, grab your mouse, become a leader and command your tribe! Take over the many islands of Electrolyte Games whimsical strategy game and, as they say, take back your history! Thanks goes to Mr. Caplin for sharing this lovely morsel of pixel goodness with the world! Inspirational Gamers of the Week: Signcraft and Coco & Co. I know it’s been a while since I’ve posted anything, and I’m sorry, but alas thus is the risk of being a college student and working. It can sap your ability to do what you love to do. Now, today I’ve found something very cool and it’s an up and starting movement. I’m so proud to know that this sort of organization exists. I want to say that, while I’ve covered The Able Gamers Foundation and love them – I personally love it when smaller, more specific disability groups form to aid those in need. In this case there’s a group called Signcraft. They’re a non-profit website that focuses on providing deaf gamers a venue to enjoy, understand, and learn about Starcraft 2 strategies, gameplay, etc. I hope they actually go further than this – it would be really inspiring to see them branch out past just a single game. I would love to see deaf-accessible game reviews, game walkthroughs, etc. not only for PC games but also console gamers. It would be a very cool concept and I see it being a large benefit for a fantastic community that I feel definitely needs exposure. Currently they only do Starcraft commentaries, but please go check them out and if you like them and like what they’re doing tell them what you’d like to see. I’m sure they’d be open to opinions and more exposure! You can find them here, but here’s their current introduction video to get you guys started. This also inspired me to go find games that are exploring the art of deaf gaming in the game culture. It’s severely indie – but that’s why I love it. I’m a sucker for indie games that challenge the norms, conformities of the industry, etc. and ‘Way’ seems fantastic – I’ll let you guys know exactly how it plays out soon! Till then here’s to you all! Take care and happy gaming to you all! Well, they did it, they finally did it. A game company finally took two of my favorite concepts in the world and smashed them together. Seriously? Did you have to do this?! – because you know I’m just going to become super infatuated with this game and then I’m never going to want to put it down – Oh, what game? Well Gotham City Impostors of course! How best to describe it? Well take one half of the Batman Universe and mash it together with Team Fortress 2 like a crash-test dummy slamming into a wall at 130 mph! That’s pretty much what this game is all about. It’s a multiplayer shooter experience that will leave you both scratching your head at its oddity, and chomping at the bit to continue the madness! Gotham City Impostors was designed by Monolith Productions and WB Games. The demo wasn’t as lush as I would have liked it to be [ no access to the character costume customization, etc. ] but what I didn’t get to discover in customization I made up for in gameplay. Color saturation/Brightness is decent enough that it won’t affect colorblind play. Controls, while complex, felt smooth and unique, after a few sessions. Menus are easy to read and understand making navigation of game easier. Enemy players glow orange when behind walls/buildings etc. as well as tag above. The Initiation Tutorial is both fun and informative. Boomerangs have auto-targetting, which is nice for motion impaired gamers. Long wait times in the Lobby queues. It took at least 5 – 10 min for enough players. No subtitles for deaf players. There is an Initiation Tutorial, but it’s all spoken audio. Precision/Motion is key – which makes game much harder for motion impaired. Multiple button inputs/Complex control scheme makes havoc for motion impaired. Screen tends to flash red when you’re shot – may cause issue for colorblind gamers. Fast paced gameplay/control scheme lends itself mostly to two handed gamers. Even though content within the game is rated T for Teen – some of the content, while blurred and bleeped, is still understandable and noticeable, which could be a downside for parents with teen gamers. Just a warning – not really a con per say. Gotham City Impostors is exactly what you want out of a multiplayer-free-for-all shooter type of game – and while it lacks a LOT in the accessibility department I’m still going to give it a nudge and suggest folks check it out. Now keep in mind too that I only played the demo, and I also only played the PS3 version, so I’m not sure if some of these negative issues are resolved on the PC version or the 360 version or not. All I will say is that this game looks like I would be willing to invest my hard earned coin into it just to roam around the city slaying Bats and Jokers all day long! Clever, unique quips – fun and stylized art and guns – and with DLC packs flowing into it, this game looks like it could take off. Now if only they could refine it a little bit – I’d be all over this thing like Batman chasing Catwoman! Addition: They have a Steampunk DLC pack – if that doesn’t scream nerdy endorsement I don’t know what will! Have any of you ever lost a toy as a child before? Have you ever wondered if they’d ever try and find you? Well I found a lovely, simple, little game that was designed by PlayKidsGames. The artist Jimp and code by Gazsmith Games collaborated together to create this lovely, charming, little platformer that I simply feel that I have to share with folks. I was immediately drawn to it due to the art style, but more than that it’s the story and childlike characteristics of this game that make me just smile when I clicked on it. Join me as we go on an adventure with a teddy in his search for his owner with, Teddy’s Excellent Adventure! I swear when I saw the title I was immediately drawn to my childhood memories of Winnie The Pooh and Christopher Robin, but while the game doesn’t have Disney-esque artwork it’s simple whimsy are what will grab you. It’s a combination platform/point-and-click adventure. The mechanics are very simple and it makes the game simple and light for all ages to enjoy. You can use either the Arrow or WASD keys for movement, and a simple click of the mouse controls interaction with objects within the game. Relaxed gameplay, that gradually amps up in intensity, is a nice touch. Simple puzzles and platforming provide exhilarating gameplay as puzzles get tough. Art style is warm, inviting, and seems to be easy on the eyes. Good for colorblind. All words/tutorials are text based. Great for deaf gamers. Music changes from moment to moment depending on puzzle/area. If you fail, game allows you to start from start of newest stage. Platforming, while simple, can become a bit of an issue for motion impaired in later sections of the game. Doesn’t ruin game, just will make game more challenging. Some sections have very similar color schemes and may make differentiating objects a bit hard for colorblind gamers later in the game. Music can be a bit loud, but can be muted, so that helps. No sound cues/audio other than music makes game extremely difficult for blind. Other than that, this game is full of fuzzy, cuddly, adventurous fluff and should definitely be looked at. It may be simple, but isn’t that something that we all sort of secretly desire? Simple games that we can enjoy and experience in short amounts of time? The game has this lush draw of trying to get to the end. You want to so desperately get your teddy back to his owner and it drives you to continue working towards accomplishing goals. 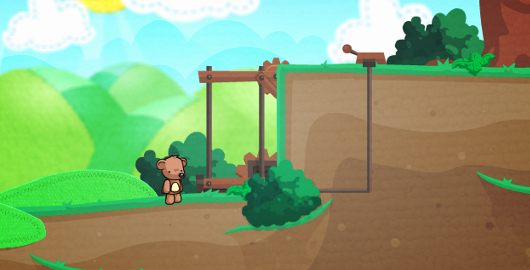 So – you can gladly check out Teddy’s Excellent Adventure on Kongregate now! – and while we’re at it I’ll also promote the promoter of this game: PlayKidsGames. Take care folks and enjoy your gaming – one input at a time! Well, I’ve been digging the inter-webs and last week was a difficult one to find any new inspirational gamers abound. Low and behold though, I was able to scrounge up a wonderful story [ and even though he’s been a gamer that’s been covered for a couple of years now ] I’m proud to be covering Quadilious’ story on Gastrogamer this week! Now – what’s so special about Quadilious that makes me admire him as an inspirational gamer? 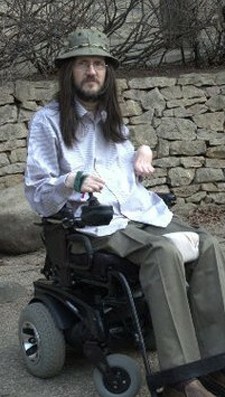 Well, to start, ‘Quadilious’ has been playing World of Warcraft [ WoW ] since 2006, and he’s been doing so as a quadriplegic gamer! Please watch in FULL SCREEN. His video is hard to read if you’re watching it on screen. He has a spinal cord injury that he suffered during a diving accident that affected his vertebrae. The injury affects his motor skills in his arms and hands, not just lack of movement in his legs. This, to most people, would be looked as a major issue when it comes to gaming, but somehow, Quadilious has overcome his struggles and he’s been playing as a part of DPS raids for years now. He’s been helping to form his own resource website for other WoW disabled gamers. I think this is great, because even though it hasn’t been up for many years, it shows off some solutions to how quadriplegic gamers can get involved with PC gaming. You can check out his website, and I would also suggest that you check out the full interview articles from WoWInsider. They share a lot of wonderful inspirational gamer stories of gamers who play World of Warcraft. I’ll probably be covering a couple of other great stories like this, but I personally think it’s fantastic when I see a fellow gamer reaching out to his gaming community! So here’s to you Quadilious! So glad to see you’ve found happiness and joy in sharing your story and gameplay with others and I am so inspired by you, because despite your hardships you seem to have truly found a happiness through gaming and the community around you! Congrats man and I wish you the best in your future WoW playing! Now what exactly is Rock of Ages? Well, let’s see – take a game like Katamari – throw in some tower defense style gameplay, and then lay on top of it the quirky animation styles and rambunctious humor akin to something you’d see out of a Monty Python animation and you’d have Rock of Ages. It’s a time-traveling, boulder smashing, tower defense game with style – and lots of it! The object is that every level – you have an opponent, and you are to roll your ball down to the opponents gate as fast as you can in attempt to break it. The opponents job is to try and stop you by placing up barracks, explosives, soldiers, catapults, and even cows within your path to slow your momentum. You alternate turns rolling toward each others gate, and the first person to break through the door and roll over their opponent wins. If that doesn’t sound interesting and fun, well then you sir [ or madame ] have very little humor in your life and I shall dub thee a ninny! For those about to ROCK – We will CRUSH you! Rock of Ages takes you on a pseudo-historical lesson while you smash into the masses, but what’s great about Rock of Ages is that it’s highly accessible to multiple players. There are a lot of aspects that they got right during the development that pose a strong case towards an accessible game. All cinematics are pantomime w/ minor voice mumbles, and if characters do speak it’s in text format – plus all rules and tutorials are given in text format. Perfect for deaf gamers. Simple controls make the game easy to pick up and control. Tutorials are simple and informative. Visual symbolism is heavy in this game making it easier for deaf gamers. Colorblind gamers shouldn’t have a problem with this game. All color tones seem to balance. Options of movement inversion, and a Southpaw setting for left-handed. Tower-defense setup isn’t timed and so you can take as much time as you need to prepare your battlefield. A definite plus for motion-impaired gamers. HUD displays are easy to see and understand how to use. If you fall off the track, an auto return action occurs placing your boulder in play. Welcome TO THE JUNGLE! We got LOTS OF PAIN! Motion-impaired gamers may have some issues steering via console – sticks tend to be a bit less sensitive – often causing boulder to fall during harsh turns in track. Text can be a tad small and unreadable in some cases for vision impaired gamers. Tower defense setup requires use of multiple buttons across controller, so it makes setup much harder for one-handed or motion impaired. Boulder is able to begin travel before your setup phase ends – so if you take longer than comp. opponent it can cause issues for your overall game. Overall though this is a quirky, out of the box, little gem of a game and I think anyone who loves history, Monty Python style animation, and just flat out loves to smash things – should definitely check out this wonderfully odd-ball smashing tower-defense game. You can pick it up on PSN, XBLA, and Steam if you’re a PSN Plus member you can get Rock of Ages for FREE, but otherwise, I believe it’s 800 Microsoft Points for XBLA, and on Steam for $ 10. I can’t imagine that the PSN purchase price would be any more than that either – so GO FORTH my MINIONS! Wreck your ball into the chronicles of history to be forever enshrined with the happiness that is Rock of Ages! I know I talk about this a lot, but I love when I find that companies are focusing their efforts in developing customizable controls/controllers. Giving folks the option to customize their hand layouts/button inputs and other aspects are what so many console players have been asking for and what so many PC gamers have been accustomed to for quite some time. I’ve discussed a couple of customizable controllers in the past: Adroit Switchblade, custom controllers via Evil Controllers, etc. ; well now I’ve found another wonderful company searching to make customizable controllers. I have a slight sadness that, for some reason, customizing controllers are mostly for 360 at the moment, but there are some for PS3. This week I’m presenting to you guys a new company to come out and bring forth a new game controller for customizing controls: The HJC Design FPS Game Controller! The HJC FPS controller is a fully customizable controller that’s available for XBox and PC and, while it may not be the best for all players [ I personally still feel the Switchblade is about the most accessible custom game controller I’ve found ] it’s still fantastic to see more companies caring about the accessibility of games. This game was designed for FPS comfort and simplicity, but does that mean it can’t make other games simple for players? Currently I don’t have a lot of price points for some of these prototype control schemes, but if they ever drop via a retail market I’ll keep my ears and eyes open for when they’re here and available. Enjoy folks and happy gaming! I’m so pleased to see more and more people/companies working towards providing further accessibility to video games. Everyone who’s been following me and everyone who’s been sharing my opinions/reviews – thank you. Thank you so much. It means the world to me to spread the love and admiration I have for accessible and meaningful gameplay and games as an industry!